Rising Star Baseball Camp Director Darren Gurney has been running the camp since its inception in 1998. Metro NY Cadets (ACBL) Field Manager - The Cadets team is comprised of premier college baseball players from top Division I baseball programs, including St. John's U., Fordham U., Stonybrook U., Florida State, Yale U., Princeton, and many more. The Cadets have had dozens of players go on to play professional baseball. Additionally, the Cadets team won back-to-back Kaiser Division titles and advanced to the ACBL Championship game. Coach Gurney was also named field manager for the ACBL All-Star Game in Lafayette, PA.
Iona College Assistant Coach - as the primary assistant coach, his responsibilities included coaching first base and working with outfielders, catchers and base runners. In addition, Coach Gurney devises practice plans, scouting of opponents, statistical analysis, and handles the recruiting of high school and junior college players. Covering All The Bases - Coach Gurney is the author of a 298 page instructional baseball book (2011) which has received rave reviews from The New York Times, Collegiate Baseball, and various professional players. This in depth coaching and playing resource features a foreword by MLB Hall of Famer Willie McCovey, an athletic development training program for baseball players, a self-diagnostic baseball exam, hundreds of detailed photographs for pinpointing proper player mechanics, dynamic in-game strategies, and much more. Subsequently, Coach Gurney received book contracts from Coaches Choice Publishers to write 101 Defensive Baseball Drills (2015) and Baseball Smarts: 100 Question Baseball IQ Test (2018). Pro Instructional Drills DVDs - Since 2011, Coach Gurney has been requisitioned to direct and film instructional baseball videos, including Pro Pitching Drills with Tom Koehler (Miami Marlins Org. ), Pro Hitting Drills with Matt Duran (NY Yankees Org. ), and various others. Howcast.com hired him in August of 2012 to film numerous pitching videos reviewing proper pitching fundamentals, grips, and throwing mechanics. These videos have tallied over three million combined views on YouTube.com. Ultimate College Prep - founder and director of college preparatory baseball program for players ages 17-18. This program has helped place dozens of players in NCAA baseball teams, including Elon, Stony Brook, Notre Dame, Iona, Fordham, Seton Hall, Rhode Island College, Columbia, and more. These intensive and comprehensive workouts along with the creation of recruiting videos/DVDs help market and prepare players for the college baseball experience. TheBaseballDoctor.com - Coach Gurney is the lead analyst for the progressive, on-line web-site: TheBaseballDoctor.com. Through video reviews and analysis, Coach Gurney has helped players across the world improve their hitting/pitching mechanics. In 2015, The Baseball United Foundation forged an agreement with Coach Gurney to provide internet-based video hitting instruction to players in Pakistan, Croatia, Ireland, Uganda, Nigeria, Iran, and Nepal. During his tenure at New Rochelle (1997-2005), Coach Gurney compiled a 124-67 record and captured the league title in 2000, 2004 and 2005. The team had its best playoff run in school history in 2003 and best record ever in 2001 with a 20-4 mark. 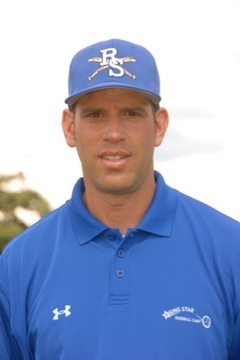 In addition he was voted Section One Coach of the Year in 2001 and League “A” Coach of the Year in 1999, 2001 and 2004. Coach Gurney helped place over thirty players in college baseball programs and also took the program on its first ever trip to Florida in 1999. Currently, Coach Gurney coaches at Keio Academy in Purchase, NY. Keio is a Japanese boarding school with a rich baseball history, including two NY State baseball championship game appearances in the last ten years. More recently, in 2016, the team won the NYS Section One Championship. In 2015, Keio played lost a 14 inning sectional championship thriller at Boulder Stadium in Rockland, NY. In 2017, Coach Gurney began coaching for Team America with USA Baseball Coach Peter Caliendo. He coaches USA Travel Baseball Teams that play competitive teams throughout the world, including Japan, Dominican Republic, Cuba, and other baseball destinations. During the August, 2018 trip to Santiago, Dominican Republic, his team comprised of seven Rising Star campers compiled a 5-2 record. In August, 2017, three Rising Star Campers played for him in Tokyo, Japan and represented their country. Click HERE for player testimonials. Like many coaches, Coach Gurney started his career as a player. As a four year varsity letterman at Washington University (Ranked #1 in USA - 2013) he compiled a .389 batting average and a .542 on base percentage in Conference UAA competition. Coach Gurney realized his dream when he was signed by the Hard Bulls in Austria of the European Professional Baseball League in March, 1995. He continued his career for the next eleven years with the Pleasantville Red Sox as centerfielder and was inducted into the Hall of Fame in November, 2005. Coach Gurney is recognized among the elite economics instructors in the country. In 2004, he was selected by NASDAQ as one of the top ten economics educators in the USA. He was one of three teachers in the USA to receive the Alfred Sloan Teaching Champion Award in 2014 for excellence in teaching economics and financial literacy within his classroom. His AP Macroeconomics students consistently score in the highest three percentile on the national AP examination. The NRHS Economics Team which he coaches has finished in 2nd and 3rd place respectively in the NY State Economics Challenge during the past two years. Coach Gurney received his B.A. in History from Washington University and his Masters in Social Studies Education from Teachers College at Columbia University in NYC. In 2015, Youth Baseball of New Rochelle honored Coach Gurney for his continued service to baseball since his days as a player growing up in New Rochelle. Executives from Westchester County and New Rochelle legislative offices presented Coach Gurney with awards. June 24th was proclaimed "Darren Gurney Day" in both the City of New Rochelle and throughout Westchester County.